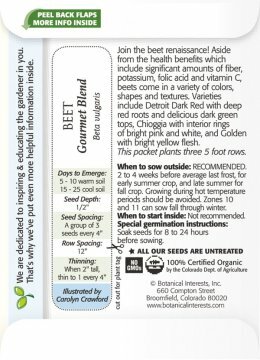 There is a lot of information contained on a seed packet, and it can be overwhelming to know what to look for when purchasing, but Botanical Interests’ seed packets make it easy. Consider these four things when choosing a variety-when it blooms, how much sun it needs, how big it gets, and days to harvest. You’ll find that information listed on the front of our packet right above a brief description of why you are going to love this variety. Once you have your packets home, the back of the packet gives you more specific sowing information. We recommend sowing based on your average last frost date and whether to start sowing indoors or outdoors. When you’re ready to plant, cutout the plant tag and secure it to a garden stake. The tag tells you the number of days before seedlings emerge, how deep to sow seeds into the soil, the distance between seeds, and recommended thinning instructions. The reverse side of the plant tag shows a visual of the seedling to help you identify it when it emerges. 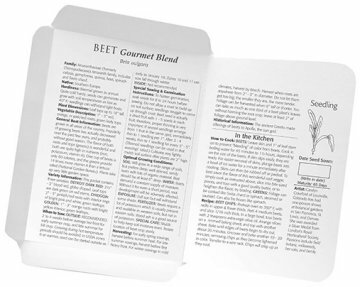 Now your seeds are planted, but there’s still more information inside the packet! The inside explains optimal growing conditions, such as how often to water and when to transplant, as well as harvesting methods. 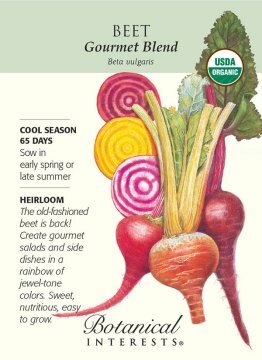 Often, our seed packets also include the history of the plant, recipes, and tips on keeping your cut flowers and harvested vegetables fresh. Having the right information is the first step in being a successful home gardener! Come look at all of our beautifully illustrated, information packed, and high quality seed containing seed packets from Botanical Interests Seed Company – a family owned business! Visit us and check out the huge selection of Botanical Interests seeds available in our Garden Center!